Skaguay Reservoir SWA #5. Division of Wildlife. Michael Seraphin, Colorado Parks and Wildlife. Photo taken: 7/7/2002. Wildlands Restoration Volunteers seeks a full-time, seasonal Youth and Stewardship Projects Coordinator who is passionate about empowering youth and WRV’s mission. The Youth and Stewardship Projects Coordinator will help WRV reach our goal of inspiring the next generation of land stewards. Through our Youth Program we partner with diverse local groups to provide education, leadership training, and restoration programs, connecting youth with environmental education, community engagement and volunteerism. Applications will be reviewed starting January 15th and will continue to be reviewed until the position is filled. Read more HERE. Angler Education Assistant: Feb. 12th through Oct. 31st, 2018. Duties include: Teaching fishing clinics and other fishing-related events; Working with schools and other community groups to schedule fishing clinics; Working with volunteers; Maintaining equipment. Click HERE for more. Schools and Outdoor Learning Environments Intern: March 1st-Nov. 30th, 2018. The SOLE Intern will be responsible for: Participating in field trip experiences as a staff photographer and blog contributor; Participating in the delivery of education programming at Family Nature Nights, other family events, and assist with programming in the classroom; Assisting SOLE staff in all aspects of program implementation. Find more information HERE. Resource Stewardship Program Technician: This position’s responsibilities will primarily include citizen science program management, biological research, and GIS technician work. This will include field work using ArcCollector tablet computer mapping, as well as assistance with the preparation of resource management plans, GIS map production, data management, biological research, threatened & endangered species analysis, production of biological training & education materials, program planning, site visits, volunteer management, and administrative duties. Find more HERE. The two positions above close on January 19th, or after 50 resumes have been received. Westminster, Colorado is seeking an Arborist Technician. This is a skilled labor position involving knowledge and practical experience in the maintenance and identification of trees and shrubs common to the Denver metro area. Work involves responsibility for performing a variety of tasks with major emphasis on urban forestry maintenance duties. Employees will be required to use computers on a regular basis to complete work orders and maintain/update the City tree inventory database. Work is reviewed by a supervisor and through inspection of work while in progress and/or upon completion. Applications accepted until January 22, 2018 at 8am. Learn more and apply HERE. recreation experiences across America's public lands. Application deadline is January 26th, 2018. Read the job requirements and application information HERE. Field Instructor: Do you love working outside? This is an exciting opportunity to join the RMFI team. 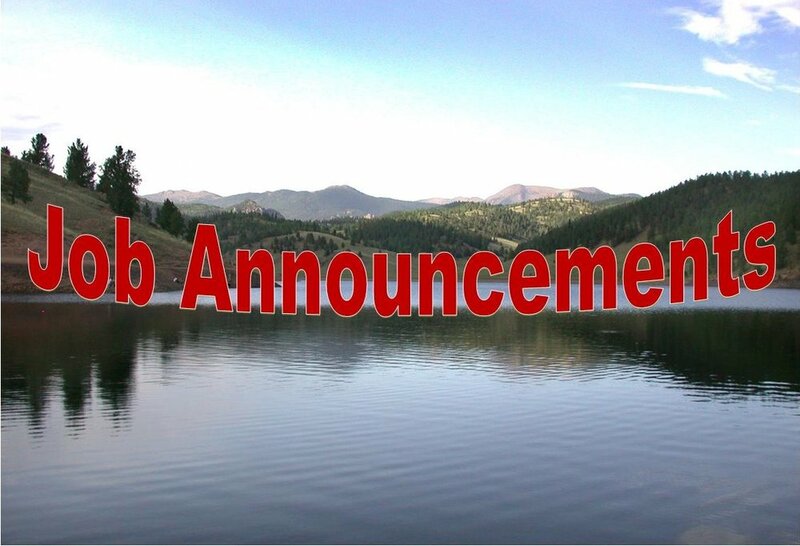 This position will work in some of the Pikes Peak Region’s most outstanding natural areas, as well as lead community volunteers, youth corps crews, and students in completing ecological protection and restoration projects. Applications will be accepted on a rolling basis through at least January 26, 2018. Interviews of well-qualified applicants are anticipated in February 2018. See job description below for full position description. Click HERE for the full description and to apply. High Alpine Field Instructor: Do you love working in the backcountry? Do you love Colorado’s 14,000-foot peaks? This is an exciting opportunity to join the RMFI team. This position will work on the Kit Carson Peak-Challenger Point Trail Improvement Project in the Sangre de Cristo Mountain Range, leading youth corps crews and college students in completing a very technical backcountry, high-alpine trail project. Applications will be accepted on a rolling basis through at least January 26, 2018. Interviews of well-qualified applicants are anticipated in February 2018. Click HERE for the full description and to apply. Jefferson County Open Space seeks a Natural Resources Specialist. The Natural Resources Specialist assists with vegetation inventory and monitoring on JCOS properties by collecting and analyzing vegetation field data, identifying native and nonnative plants using dichotomous keys, assisting with preparing reports based on sound scientific and biological principles, and assisting with resource planning efforts. Application deadline is January 28th, 2018. More information can be found HERE. Colorado Senate. Anyone interested in applying to be a member of the Water Quality Control Commission should submit an application and resume at your earliest convenience, but at least by February 15, 2018, to the Governor’s Office of Boards and Commissions. Read more HERE. And work in a dog-friendly office with Juniper, Jude, and sometimes Luna! If this sounds like your cup of tea, you can apply here and find application instructions here. Applications will be accepted on a rolling basis until filled. Applications will be accepted through March 26th, 2018. Volunteers for Outdoor Colorado (VOC) seeks two full-time Seasonal Project Managers to work closely with the VOC project team to provide professional project management, logistical support, and volunteer leadership coordination on VOC volunteer projects both administratively and in the field. This Seasonal Project Manager is a full-time, term limited, non-exempt position that reports to VOC’s Senior Projects and Trainings Manager. This position works within the VOC program team and closely with two other project managers to provide professional project management, logistical support and volunteer leadership coordination on VOC volunteer projects administratively and in the field. Learn more and apply HERE. Northern Water seeks a Water Efficiency Program Manager who will be responsible for the development, evaluation, management, and advancement of Northern Water’s regional urban water efficiency efforts. These efforts include identifying, developing, implementing, and advocating programs, practices, and policies that promote urban water efficiency and demand management in order to assist stakeholders in meeting their water management objectives. Position will be open until filled. Click HERE for more. Mountain Park Environmental Center seeks a Development Director responsible for planning, organizing, and directing annual fundraising including the annual campaign, direct mail solicitations, special events, and the full life cycle of foundation and trust grants. The Development Director works closely with the Executive Director and the Board of Directors in all fund-raising endeavors. This position is a full-time, salaried position. Salary is competitive and based on experience. More information and application can be found HERE.